EMS have developed 2 unique entrance matting systems for London Underground combining Low smoke & Toxic fume emission rubber with an excellent drainage facility incorporated into the Debris Channel system. Both systems are Section 12 approved and are currently in situ throughout the LUL. Examples of stations where this range is being used include Farringdon, Cannon Street and Tottenham Court Road. Upon the success of the Multi-directional design, specifiers requested an option that could be used in applications not subject to Low smoke and toxic fume emission parameters. Enter EMS Multi-track NS12 (non-section 12) which incorporates all the benefits and design features of the original, but at a more cost efficient price tag. 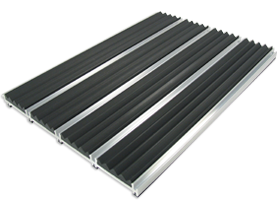 This matting system consists of a solid aluminium extrusion with a low smoke and toxic fume emission, heavy ribbed black rubber insert. Our innovative Debris Channel system has the perfect solution as the channel sections collect debris below the surface of the mat and provide an excellent drainage facility. As a result there is less dirt and moisture on the surface of the mat that can be tracked into the station by foot/wheeled traffic. Following the success of the New LU DC Matting EMS were approached by LUL with a dilemma. LUL were looking for a solution for entrances that are exposed to multi-directional foot traffic. The solution is in this revolutionary design, unique to EMS. 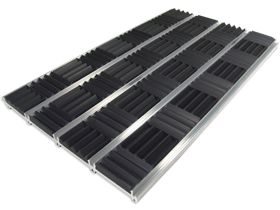 The matting consists of the same aluminium extrusion as the New LU DC Matting except the rubber infill is arranged in a chequer board pattern. The innovative design provides maximum grip in any direction, hence the name, “Multi-track”. Designed to withstand heavy footfall in any direction as well as benefiting from our unique debris channel system. Another exciting feature of this innovative system is the development and commercialisation of natural, halogen free rubber – a world first (in association with Tun Abdul Razak Research centre www.tarrc.co.uk ). The popularity of the Multi-directional design for London Underground station has become a design hit. Many architects were keen to specify it for commercial and retail applications, however due to the fire-retardant properties of the original it was often outside of everyday budgets. So EMS developed the same design in a SBR rubber that can be used in every application at a very competitive price. It has been widely used for transport, education and retail environments.